Hair fall is usually a natural process. 50 to 100 number of hair per day can fall naturally and then regrow. Your body goes through the cycles of hair replacement on your scalp. There is a rest period of 2-3 months, then they fall out and a new hair grows in its place. 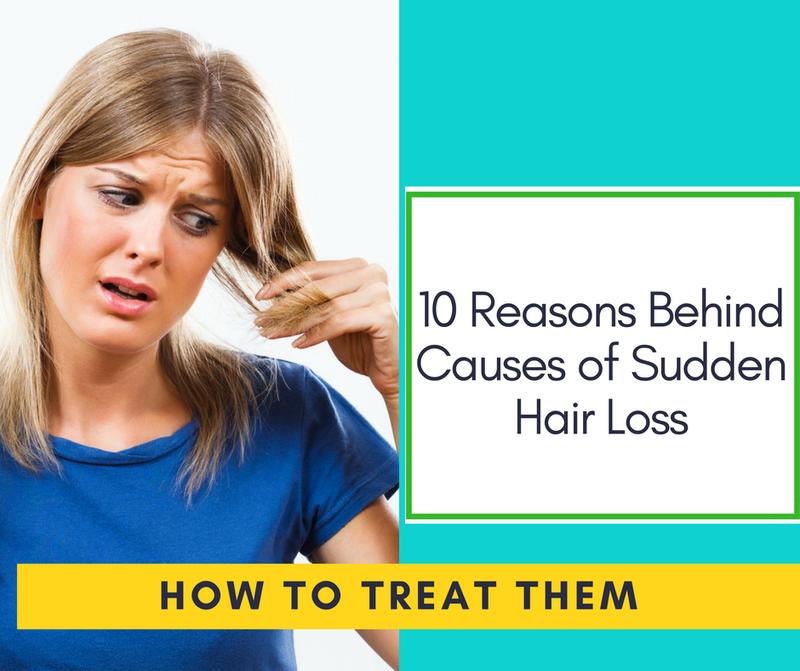 But if you are suffering from sudden hair loss, then there are several causes of sudden hair loss which may be temporary or permanent, you should know fact about hairs. Actually baldness or hair fall can be a predominantly genetic problem, determined to some extent and your lifestyle. On the other hand, there may be other reasons for sudden hair fall. Thyroid disease – Thyroid disease includes both hypothyroidism and hyperthyroidism. So it may cause diffuse hair loss because hair growth depends on the proper functioning of the thyroid gland. If you have thyroid disease the abnormal levels of thyroid hormone produced by the thyroid gland can result in hair changes. You may also be concerned about changes in your hair’s texture, noticing that it has become dry or coarse (with hypothyroidism) or extra soft and fine (with hyperthyroidism). It is important to note that with the treatment of your thyroid dysfunction it is also necessary to take hair loss treatment. Alopecia – Androgenetic Alopecia is caused by androgens in genetically susceptible women and men. It is a common cause of hair fall in both male and female. This condition in men is known as (MPHL) male pattern hair loss. Male pattern hair loss is believed to be due to a combination of genetics and the male hormone dihydrotestosterone.In which hairline receding in “M” shape and hair will be thin and eventually they fall leading to hair loss and baldness the female, it is known as (FPHL) female pattern hair loss. In this condition, hairs become thin all over the head. In female hairline rarely recede but hair begins to thin at the line of parting and it is gradually increasing in area to advance grade of diffuse hair loss. Stress – It is well known that stress can cause hair loss, it can be related to emotional stress, physical stress or anxiety. Excessive physical or emotional stress, that is associated with injury, illness or surgery, can cause hair loss. When you’re stressed or anxious, your body produces extra hormones to prepare itself to deal with whatever it thinks of as being a potential threat. This change in your hormonal levels can affect your body. When these extra hormones are formed, they can affect the growth pattern of hair follicles on your scalp. Use of other medications for treatment like cancer – If you are using any type of medicine to treat your health conditions, you need to be aware, sometimes this medicines can cause unwanted side effects on your hair like changes your hair colour, texture or hair loss. This type of hair loss called Medication Induced Hair loss. These drugs are interfering the normal cycle of hair growth during anagen phase, which lasts for 2-6 years. The good news is that in most cases, it’s reversible once you stop taking the medication. After pregnancy – After a few months of pregnancy, hair loss occurs in women but it does not happen in every woman. It is postpartum hair loss and no to worry about this because it is a normal and natural process. This can continue for up to 24 weeks, but it is rare to prolong beyond 15 months. This condition is called postpartum alopecia. Oestrogen levels increase during pregnancy, which prolongs the growth phase of the hair. That means less hair fall, which is thick, healthy and shiny. After delivery, estrogen level comes to back normal and it will cause excessive hair fall. This condition is short term and after 6 to 12 months regains your hairs normally. Dietary requirements also increase after the birth of baby due to lactation, so food supplements are must during this period. Low Vitamin Level – One of the most important reasons for hair loss is Vitamin deficiency. Vitamin deficiency may impact hair structure and hair loss because hair follicles need to have certain vitamins to be healthy. Some nutritional supplements can help restore hair growth or prevent hair loss. Each vitamin plays an important role in healthy hair. Some are there: Vitamin B, Vitamin C, Vitamin D, and Vitamin E.
Anaemia – Anaemia is that condition in which RBC (Red Blood Cell) or Hemoglobin production is decreased in the body. These red blood cells contain a protein known as haemoglobin which carries the oxygen throughout the body. If the RBC or the red blood cells count is low, then the hair follicles will not get enough oxygen.As such, the hair follicles become malnourished and eventually stop growing. Loss of blood, illness and pregnancy can also be causes of anaemia and anaemia caused hair loss problem because it is essential for hair growth. Iron deficiency is the most common in females. Most common risk factors for developing anaemia are Pregnancy, Family history, Deficient Diet, Menstruation, Intestinal Disorders and Chronic malabsorption conditions. So the hair loss due to iron deficiency is controlled by the taking of supplements or injectable. Hormones – Hormones released in less or more amount than our requirement is called hormone imbalance. Hormonal imbalance may increase in various age groups. The hormone mainly responsible for hair loss is DHT (Dihydrotestosterone). DHT is a derivative of male hormone Testosterone. When the testosterone level is increased in the body, it increases the rate of hair loss.DHT cause miniaturization of hair follicles and this contributes to male pattern hair loss. Testosterone is normally converted into DHT by an enzyme 5-alpha reductase. Testosterone is an androgen that case Androgenetic alopecia in male and female both. Taking a DHT blocker or reducing the level of DHT will help prevention of hair follicles to fall. But it will not make hair grow back. Over styling on hair – Over hair styling also cause hair fall. It is also one of the reasons for hair thinning or losing. If you use a harsh comb or make tight ponytail it create tensions on hair follicles, leads to hair inflammation and produce scarring and cause permanent hair loss. Use of chemically products (e.g., hair dyes, perms, bleaches, tints, and hair straighteners) is also affecting the hair follicles and they make hair brittle, thin and damage. After recovering from Illness – Patients who undergo major surgery or severe illness may suffer from hair loss after 2-3 months of recovery. Sometimes patients may lose a large number of hairs. It is directly related to physical or mental stress. This type of hair loss is temporary. If you have a severe illness like fever, dengue, jaundice etc., our immune system has to fight with it and it becomes overactive, unfortunately, it behaves like an autoimmune system. It feels hair follicles are foreign particles and they attack them by mistake. In which hair are lose but this type of hair loss is temporary, not permanent.